Chinese football legend and ex Everton player Li Tie has guided Wuhan Zall back to the Chinese Super League after an enthralling 2-2 draw against Meizhou Meixian Techand. This ensured their promotion back to the top flight of Chinese football. There were ecstatic scenes at the final whistle as Wuhan Zall celebrated wildly at the final whistle after the success because they were once a club that was once in disarray and will now take its place back in the spotlight amongst the elite of Chinese Football. 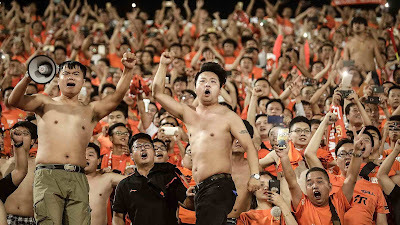 Wuhan Zall have led the way in the Chinese League One table for most of the season, and therefore the promotion had an air of inevitably about it, however when the promotion was sealed Lie Tie and his staff witnessed amazing scenes inside the University Stadium as fans and players celebrated the success. Leading the way in the table from early May, no one can argue that they have by far been the best team in the countries second tier and deserve their crack at the top level next season. Wuhan’s chairman Yan Zhi said, "We're deeply convinced that such a great metropolis as Wuhan is crying out for a top professional football team to fill with local people's passion and love for this city”. It seems that he is determined to do everything in his power to make this happen. They have built a new academy, add that to the promotion and it is clear for anyone to see the Chairman wants to make his club successful. They will be looking forward to the new challenge regardless how difficult it will be, and they will be hopeful that they can keep Wuhan in the Chinese Super League, and then help to consolidate them to become a mainstay in the league for years to come.